When you have been looking forward to a shower, the worst thing that could happen is a trickle when you want a strong blast. When you have been looking forward to a shower, the worst thing that could happen is a trickle when you want a strong blast. So how can you prevent that troubling loss of shower pressure? We’ll show you how to do it! Start by examining your pressure balance valve. 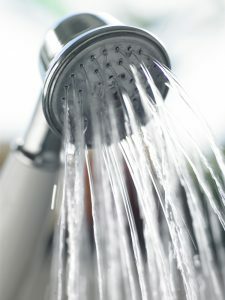 There’s probably only one switch that controls both the temperature of the water, and the amount of shower pressure. However, the shower might be affected if another fixture nearby is used – such as the sink running or the toilet flushing. Depending on the amount of space and the overall layout of your home, you might have a shower stall or a tub and shower combo. In the combo, there is a component known as a diverter valve. This valve is what switches or diverts, the water supply back and forth between shower mode and tub mode. Eventually, this valve will stop working as it should, and it takes a professional plumber to determine if this is the case. Luckily, unexpected clogs are easy to fix. Either the pipe is blocked, or the showerhead itself has been clogged. You should detach your showerhead from its fixture, and then look at it more closely. Sometimes all you need to do to get rid of a clog is to soak the showerhead in the cleaning solution of your choice and then take an old brush and scrub it down. Another culprit could be hard water, but that can be resolved with the installation of a water softener. Unfortunately, it’s likely that you have broken pipes. When you have broken pipes, your home’s plumbing system is less than stellar. The biggest problem with broken pipes isn’t just the loss of shower pressure. It’s the potential for finding water damage somewhere else in your house. Chances are, it’ll be in a place you would least expect, too. This entry was posted on Friday, February 9th, 2018 at 9:54 pm. Both comments and pings are currently closed.